Spread 1 tablespoon of the mayonnaise and 2 teaspoons of the pesto onto each tortilla. Top each tortilla with a handful of spinach, sliced bell pepper, sliced turkey, and crumbled feta. Fold the bottom and top of the tortilla in towards the centre of the burrito, then roll it from left to right. 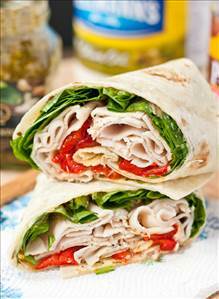 There are 418 calories in 1 serving of Spinach, Roasted Red Pepper & Feta Turkey Wrap. Calorie Breakdown: 40% fat, 40% carbs, 20% prot.